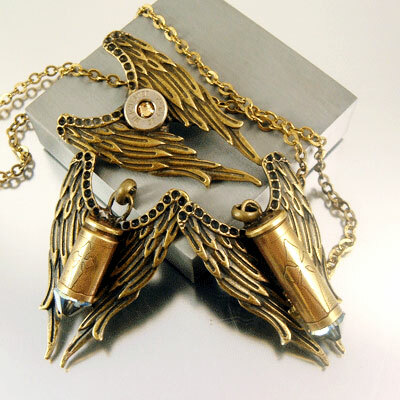 In September 2012 artist and designer Julie Teeples introduced another, never before seen original bullet jewelry line named the “Archangel”. The angel wing jewelry design is unique, stylish, breathtaking to say the least, and beautifully done. To start she uses 3 calibers of bullet sizes in the line; there are 3 main angels mentioned in the bible. She has given each caliber its own name. The .9mm caliber named Michael, his name is a battle cry; both shield and weapon in the struggle, and an eternal trophy of victory. The .38 SPL calibers named Gabriel “...who is the strength of God”. And finally the .357 Magnum named Raphael; the divine healer who was sent to cure and comfort afflicted souls. Each bullet necklace is individually hand made by Julie in her studio. These bullet pendants are meant to be seen and noticed; they will without doubt start many conversations. The impressive yet manageable 2-1/8” L x 1-2/4” W size pendants come with your choice of either a 4mm antique brass chain, a GP large link chain or for a casual look; a black leather adjustable cord. 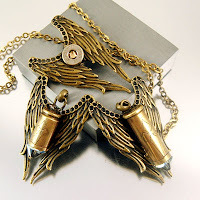 The Archangel line of bullet necklaces are stunning and make a wonderful and unique one-of-a- kind gift for anyone who may need a little protection from the angels amongst us. Come see Julie’s line of stylish bullet and other jewelry at OakCityGallery.com or TheSmokingBullet.com where you’re sure to find something you’ll fall in love with.